This is my plea to all rockstars past, present, and future: If you ever write a book about rockstardom please, please, please, pretty please with cocaine and slutty groupies on top DO NOT spend pages explaining recoupable debt. 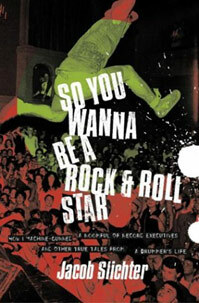 After reading Jake Slichter’s So You Wanna Be a Rock & Roll Star and Jen Trynin’s Everything I’m Cracked Up to Be. I feel as though I pretty much know everything there is to know about recoupable debt (which is basically a record company’s evil scheme to make rockstars indentured servants). One thing I did learn from Slichter’s book about being the drummer for Semisonic is that most music radio stations are total shams run by greedy fucks who are drunk on their power. Slichter gives an exhausting account of what a band has to do, and spend, to get a song on the radio. It’s sickening. There, I just saved you days of reading. You should thank me. If I ever become a rockstar, my memoir is going to be about nothing except how much fun I had sleeping with cute groupies, how dueting with Mike Doughty was the highlight of my life, and how I shunned John Cusack’s pleas for me to commit to him. Hell yes. I’ve decided I am done with non-fiction for a bit. I’ve just banged through three of them and I’m longing for the delicate and beautiful world of fiction. I miss fiction. So instead of reading Girls Like Us as I planned, I’m going to be reading Girl by Blake Nelson. This book, which is tangentially about rock and roll, has been sitting on my bookshelf, unread, since I got it as a birthday gift back in like 2001. It’s time has come.